Cornell Neurotech, a joint initiative between the Colleges of Arts & Sciences and Engineering, launched in 2015 thanks to a multimillion dollar seed grant from the Mong Family Foundation, through Stephen Mong ’92, MEN ’93, MBA ’02. Cornell Neurotech is developing technologies and powerful new tools needed to reveal the inner workings of the brain, with a particular focus on how individual brain cells and complex neural circuits interact at the speed of thought. Solving the mystery of how circuits in the brain produce behavior, thoughts and feelings is one of the most important scientific frontiers in the 21st century, providing the foundation for understanding such profound behavioral deficits as Alzheimer’s disease, schizophrenia, and depression. Making headway on these problems requires major technological innovation and its application to reveal the basics of brain organization and its function and dysfunction. Cornell Neurotech aims to fill that gap by developing and applying technologies emerging at the interfaces between physics, engineering, chemistry, computer science and the life sciences. The Cornell Neurotech collaboration grew from grassroots faculty interest, spearheaded by Joseph Fetcho, a professor of neurobiology and behavior and Chris Xu, a professor of applied and engineering physics, that received initial support from the Kavli Institute and its director, Paul McEuen. The announcement of President Obama’s BRAIN (Brain Research through Advancing Innovative Neurotechnologies) Initiative to accelerate the development and application of neurotechnologies led the faculty group to turn their grassroots effort into a more formal program. Eventually funded by the Mong Family Foundation, the group launched the cross-campus Cornell Neurotech collaboration. Xu and Fetcho were named co-directors. 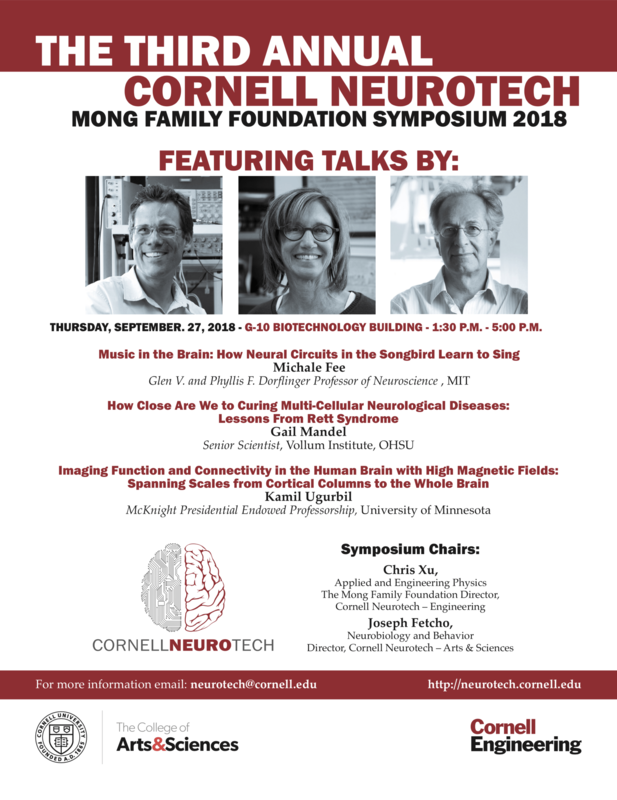 In his opening remarks at the second annual Cornell Neurotech Mong Family Foundation Symposium Sept. 22, Cornell Provost Michael Kotlikoff said: “The goals of Cornell Neurotech are vital ones, with life-changing implications, and I am grateful to Stephen Mong and the Mong Family Foundation for enabling Cornell faculty and staff to strive toward them. Cornell Neurotech fosters connections across the Ithaca campus and our Ithaca and NYC campuses, one of our major strategies for strengthening Cornell.” Read the Full Cornell Chronicle article here.